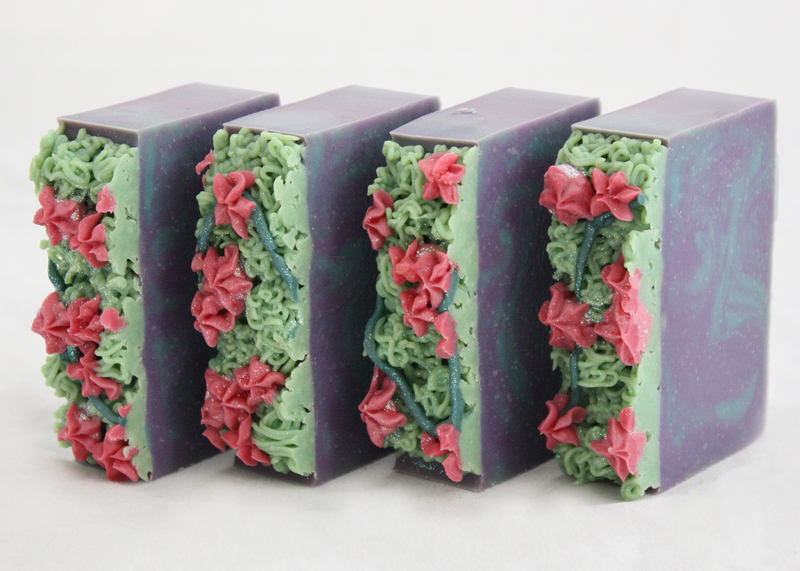 Spring Soaps are now listed on my webpage – http://www.jennifersoap.com – Enjoy! The last two are blends I put together. I like them. They’re fresh and summery. 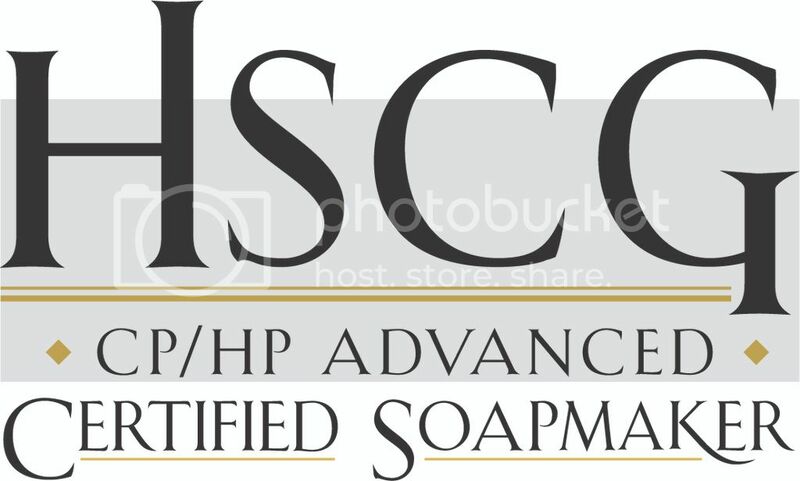 Of all the soaps this one didn’t go right. I forgot the white layer. Realized it after I poured it. Oops. 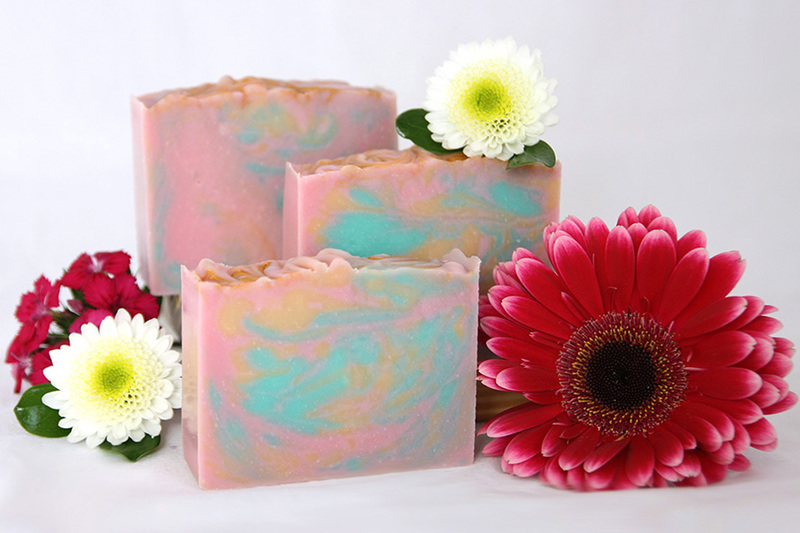 Then the fragrance accelerated VERY quickly and it was challenge just to get it in the mold. It smells good and looks fine, but I’m bummed that it didn’t come out perfectly. 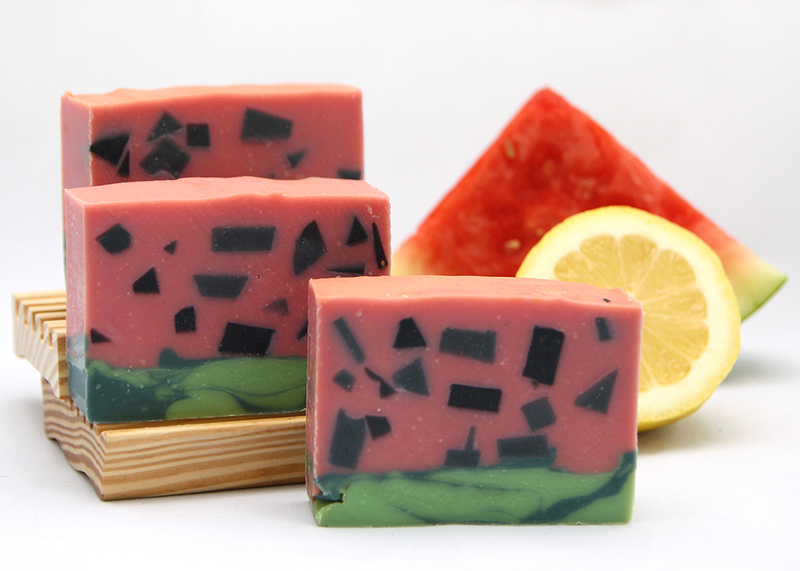 The watermelon start off with a fruit blend of melons, peach and strawberry with a hint of vanilla. Followed by the aroma of a freshly squeezed juicy lemon. I was going for a lady bug look here. 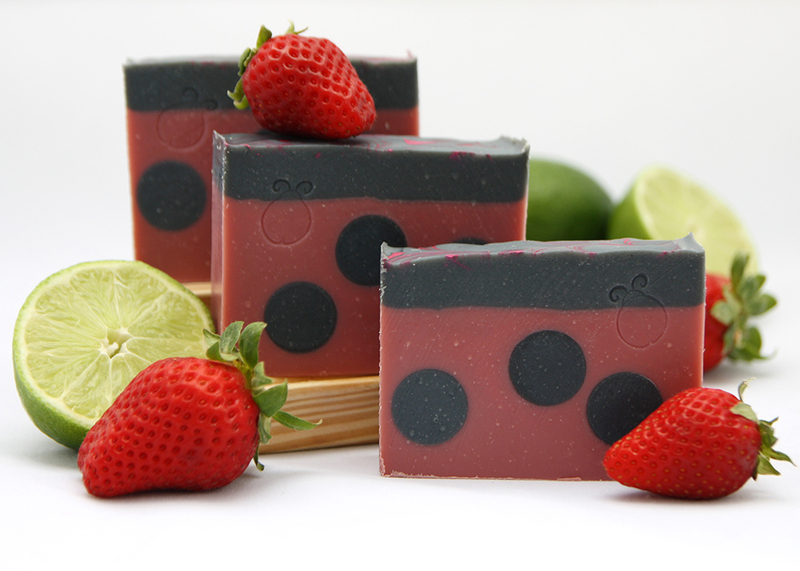 It didn’t come out perfect, but I think it’s at least distinguishable as a lady bug when you look at it. 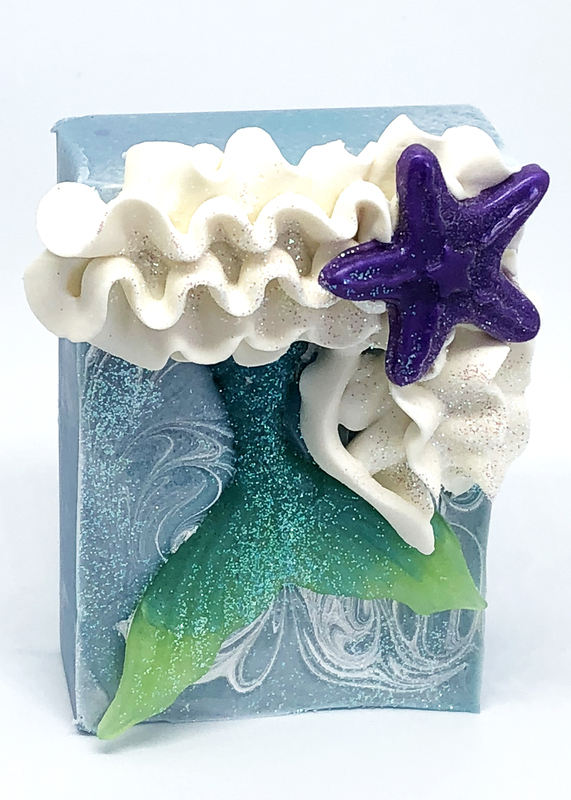 This refreshing fragrance is an accord of Kaffir lime, Japanese grapefruit, tangerine, and lemon; middle notes of bergamot and strawberries; sitting on base notes of brown sugar and oakmoss. 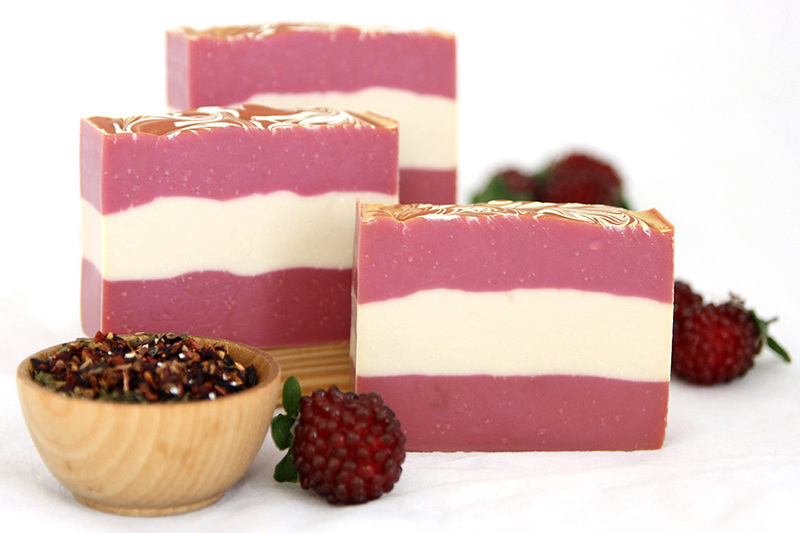 Combines with vine ripened strawberries. 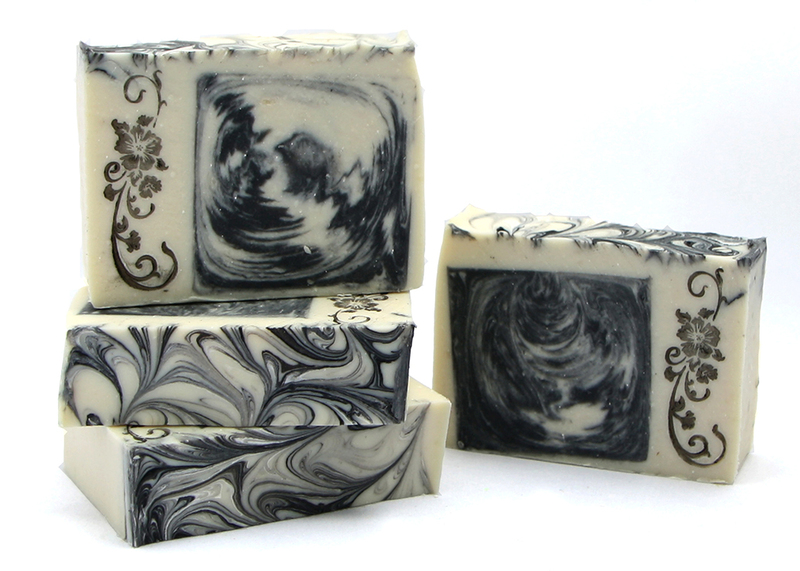 Of all the soaps, the Lush Linen didn’t go quite as planned. I was also trying to mimic a past design…which sometimes it’s best to leave old designs in the past because try as I might I can never quite duplicate that first batch. 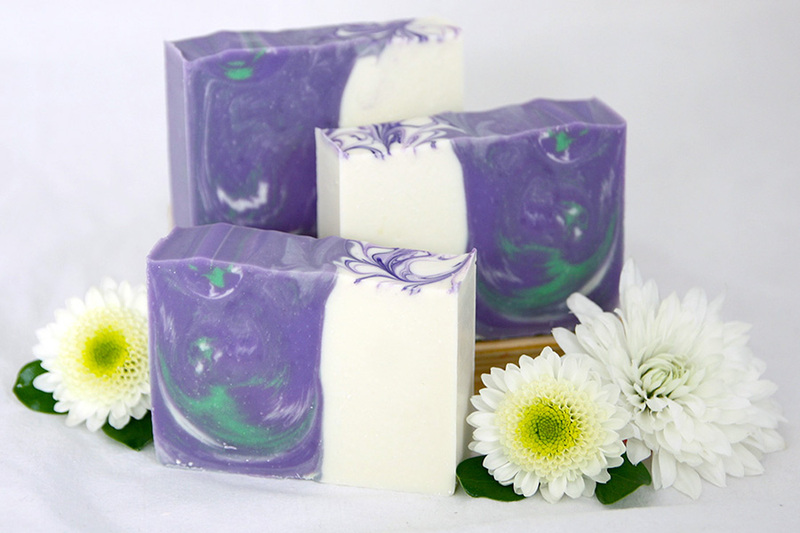 Lush Linen fragrance is a luxurious sun-bleached linen wrapped in lemon blossoms and white tea infusions. Aromas of blooming muguet enhance the clean sweetness, while sandalwood and vanilla balance the airy, ozonic quality of this fragrance. 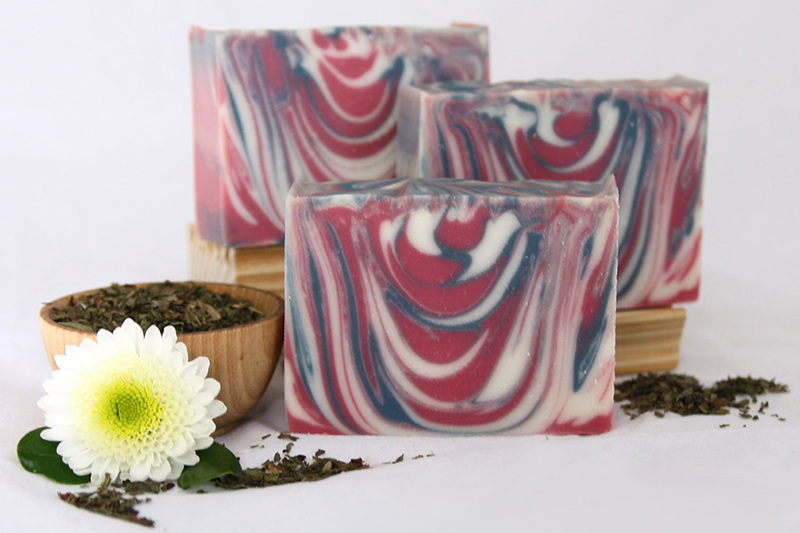 This fragrance oil is infused with natural essential oils, including Patchouli. Years ago I did a lemon verbena. And I’ve been asked periodically for it over the years and decided this summer I’d bring it back! Can I just say I made a complete mess as I tried to “dust” the heart. Ha! It worked, but it was messy. 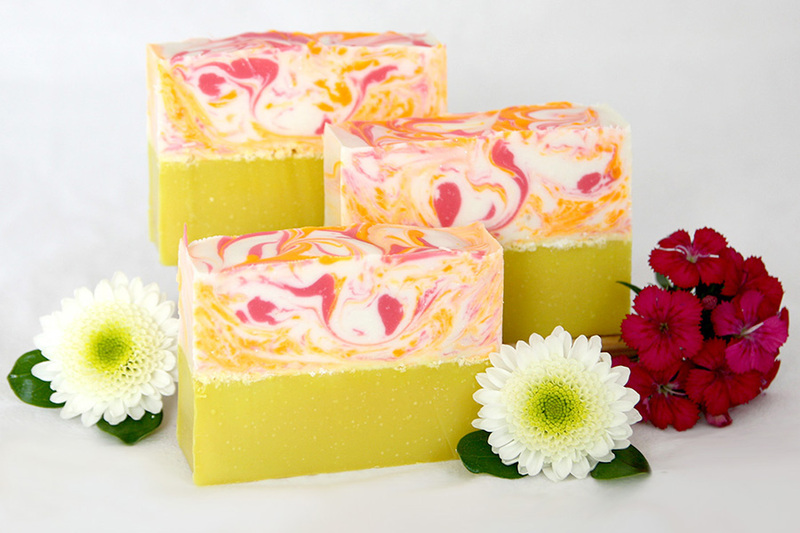 Spunky lemon & floral verbena combines in this uplifting delight. 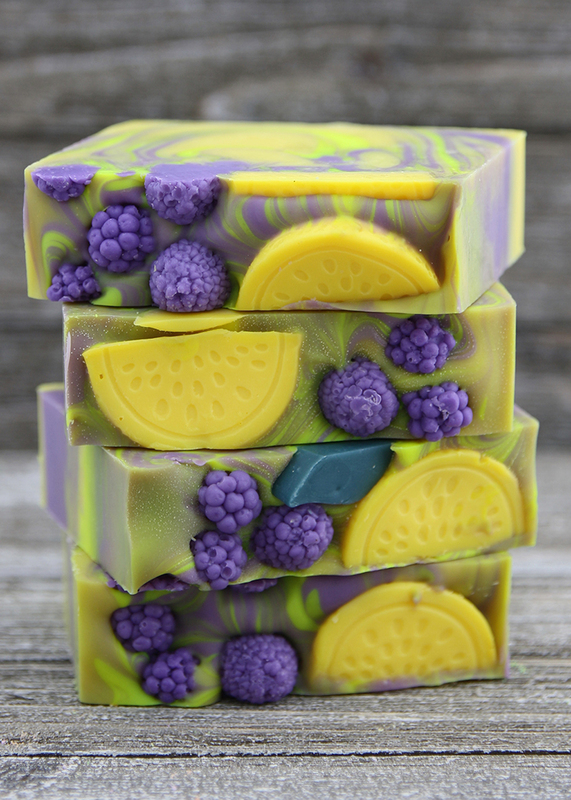 The scent begins with tangy lime, grapefruit & lemon. 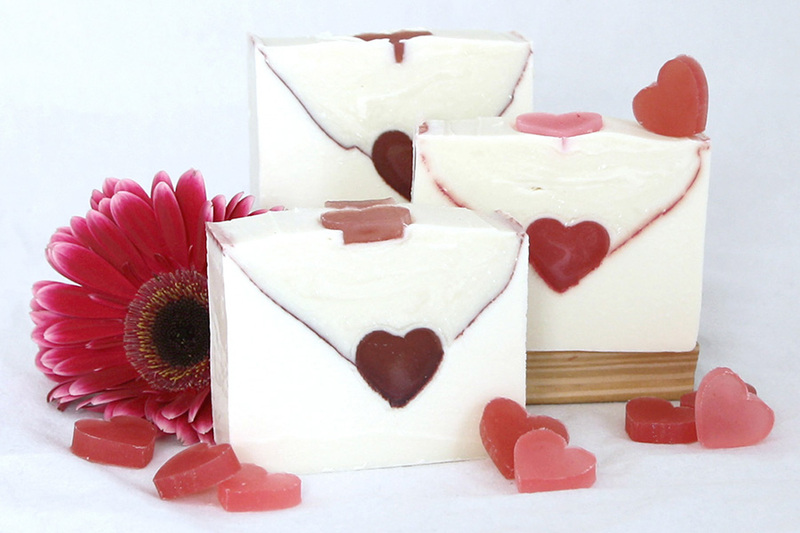 The heart combines lavender, geranium rose & lemongrass. The dry is a soft woody musk. 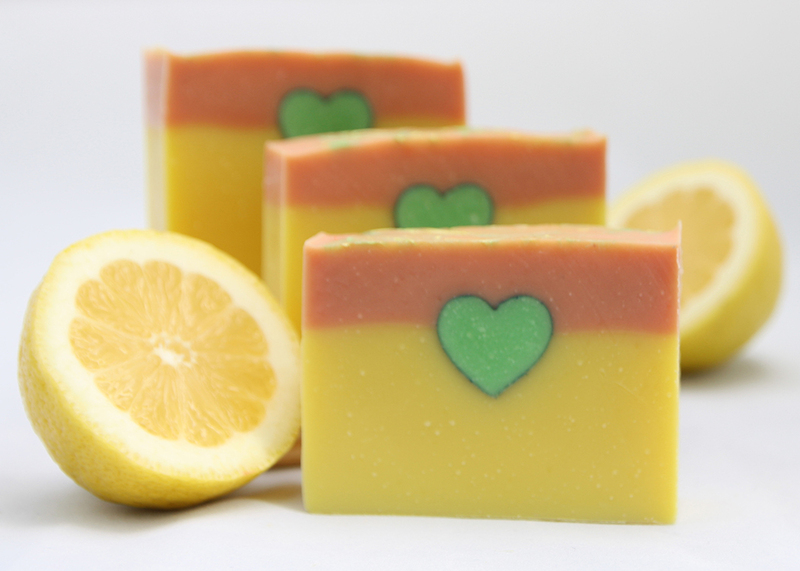 This fragrance oil is infused with natural essential oils, including citronella, lemon and orange. I was surprised how much I liked this fragrance. I didn’t think it would be one I cared for. It’s got this unique fresh smell but mellowed with a sweet coconut scent. I love the ying-yang design. Again lots of work to make, but it looks cool! 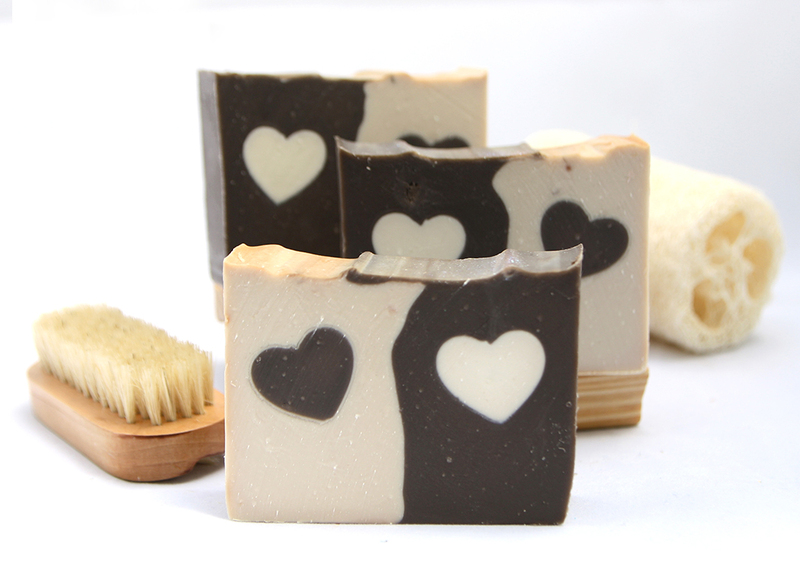 Bamboo and Coconut overflows with the lushness of green coconut, fig leaf, and tender fruit notes. 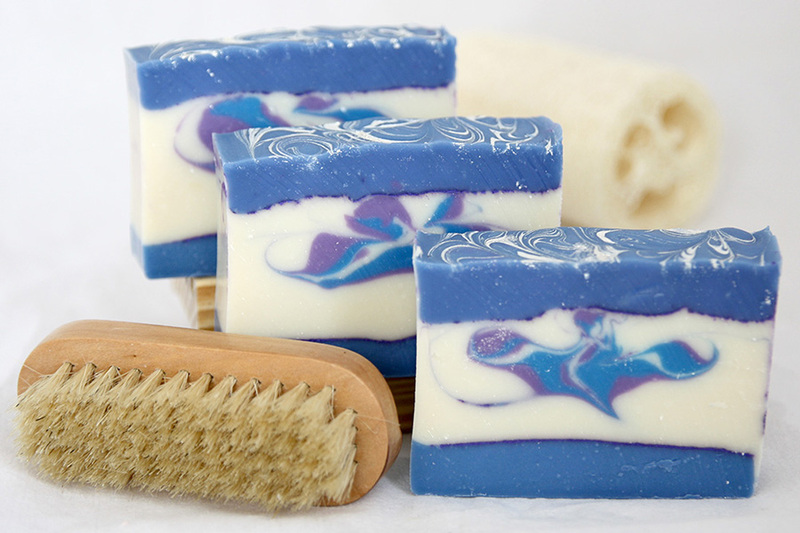 This soothing blend has a luxurious softness that’s reminiscent of a spa, or a tranquil bamboo forest. 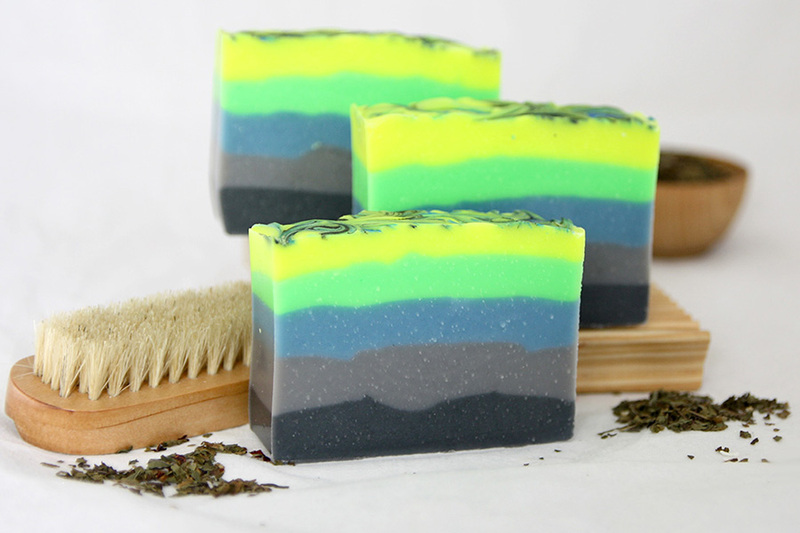 Bright top notes of lime blossoms and crisp, green leaves blend into this airy, ozonic escape. 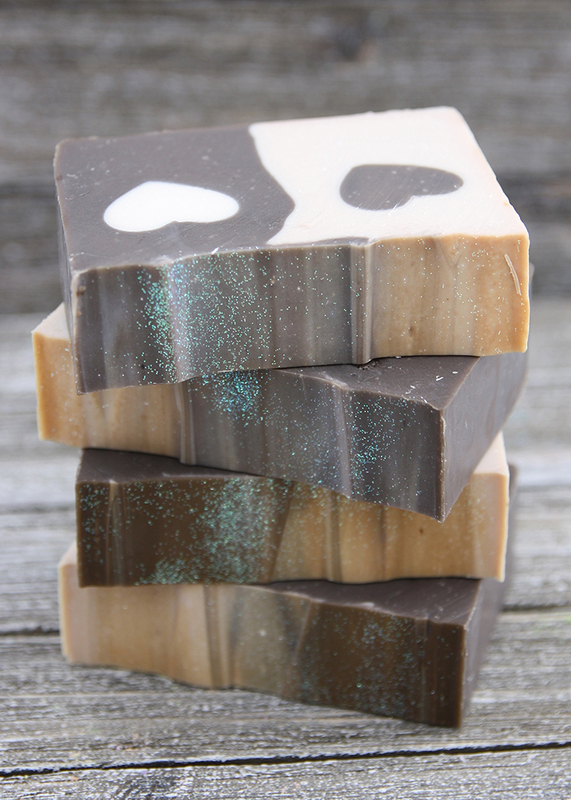 The fragrance is beautifully grounded by touches of driftwood and vanilla. 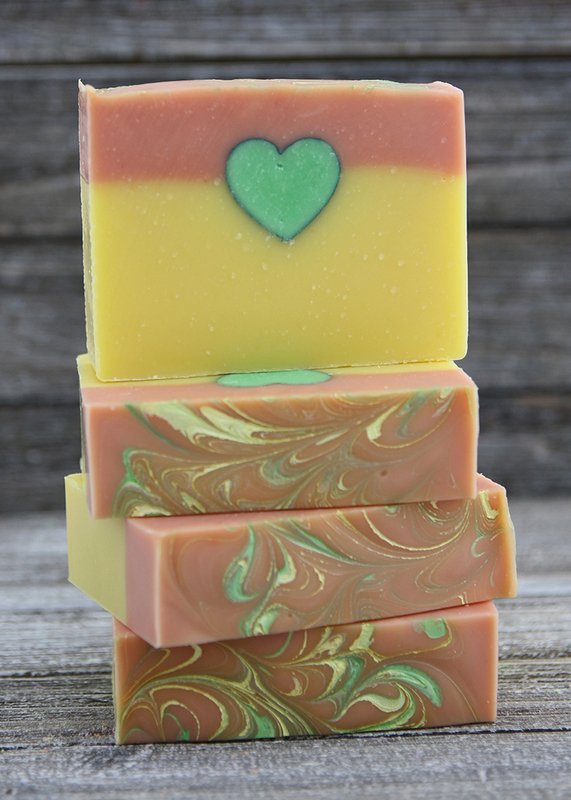 Lemon, eucalyptus, and cedarwood essential oils add layers of depth to this complex fragrance. 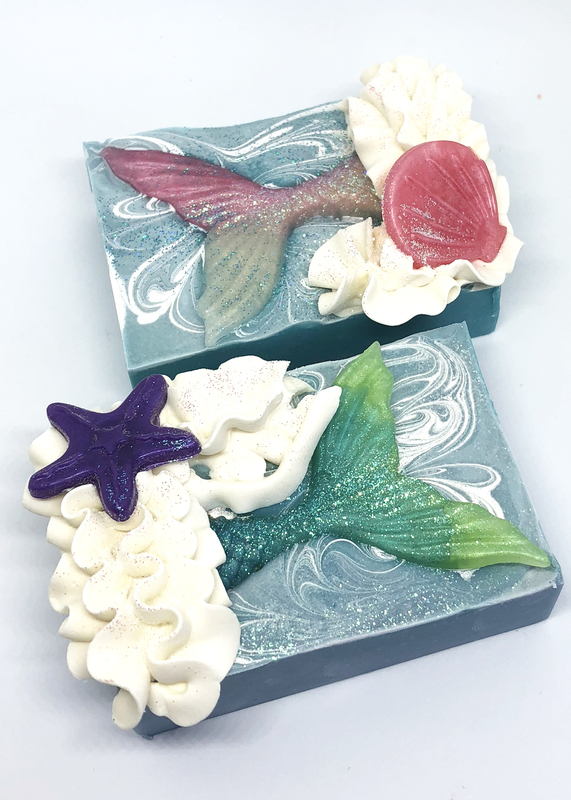 This fragrance oil is infused with natural essential oils, including Lemon oil, Cedarwood oil, Eucalyptus oil, Lavandin oil, Patchouli oil, and Spearmint oil. 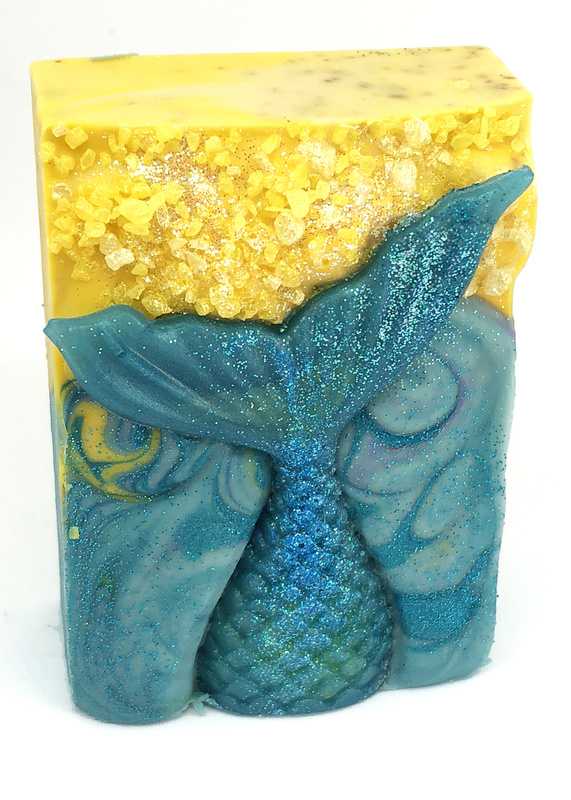 I have to say I really liked how all my summer soaps turned out this year. They were A LOT of work (more work than I anticipated for some), but worth it. I love this design. It is a lot of work to make the embeds, but the end product is so pretty! And the colors! The little bit of “neon yellow” just makes me smile. 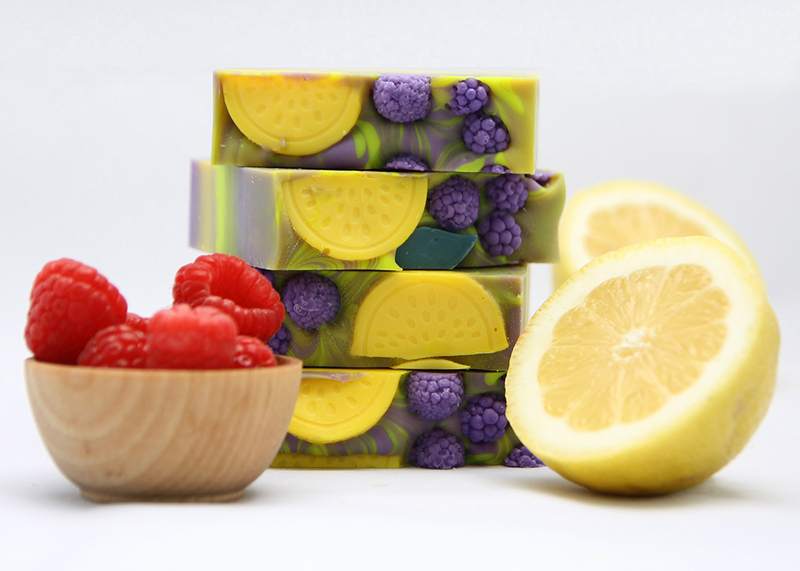 This fragrance oil is the mouth-watering combination of ice-cold lemonade, sweet, juicy raspberries; with a unique twist of natural lavender and white musk. I didn’t think I’d love this scent as much as I did. 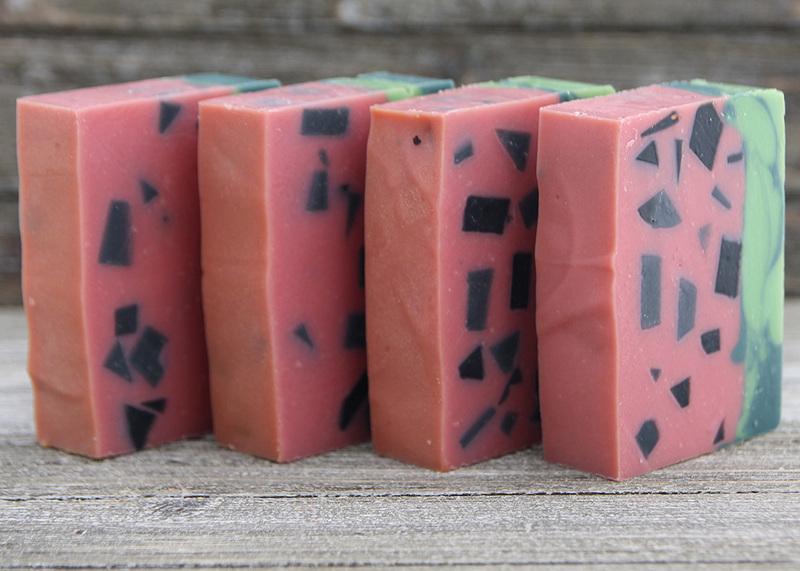 In fact I’m making a small batch for myself (as I put coffee grounds in this soap thinking it make a good gardener’s soap and I dislike scrubbies in my soap ha!) This design was a good amount of work too, but worth it in the end. 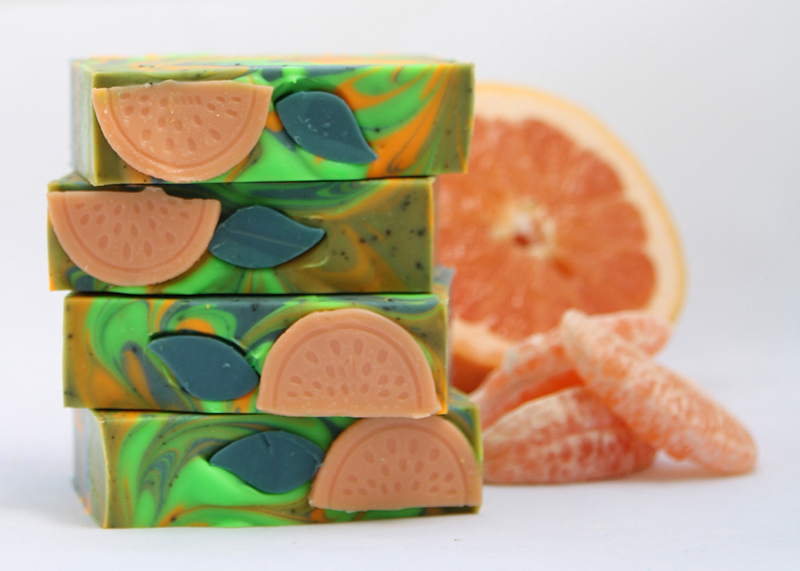 Grapefruit and Mint is a super refreshing and sophisticated summer fragrance. It starts with ripe, tangy grapefruit fused with garden-fresh mint. 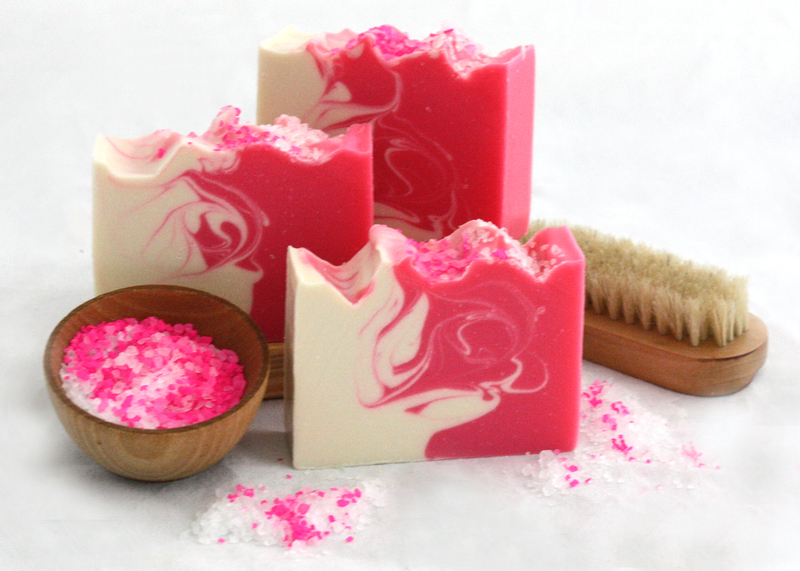 Hints of lavender and rhubarb add depth and complexity to this fresh fragrance. 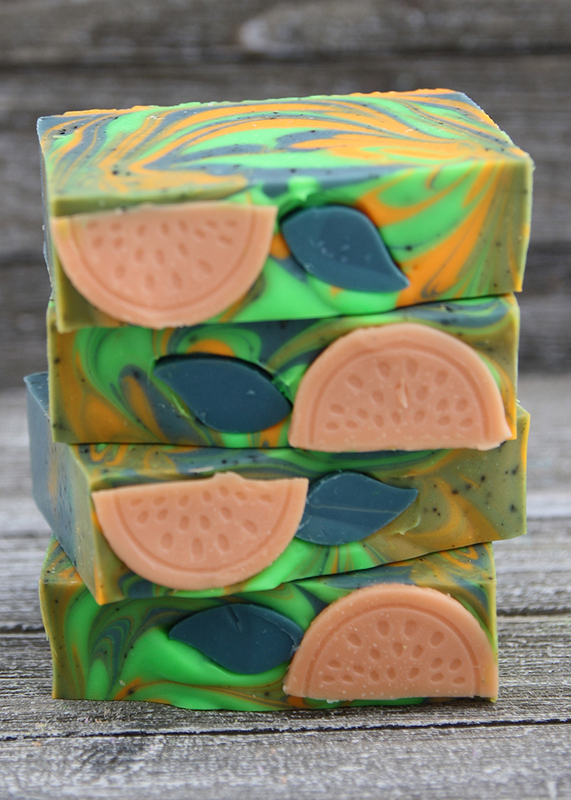 Citrus essential oils enhance this bold scent, while mint, thyme, and bergamot essential oils give it an herbal counter to the punchy, juicy grapefruit. This fragrance oil is infused with natural essential oils, including Grapefruit, Mandarin, Orange, Lemon, Thyme, Bergamot and Buchu Leaf. 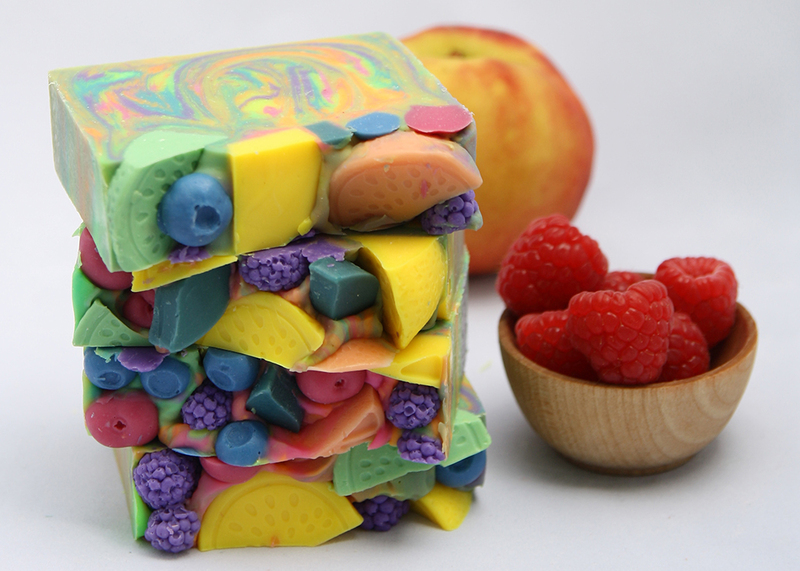 This has a fruit punch design because there are so many fruits in the fragrance (even if the name doesn’t indicate it.) 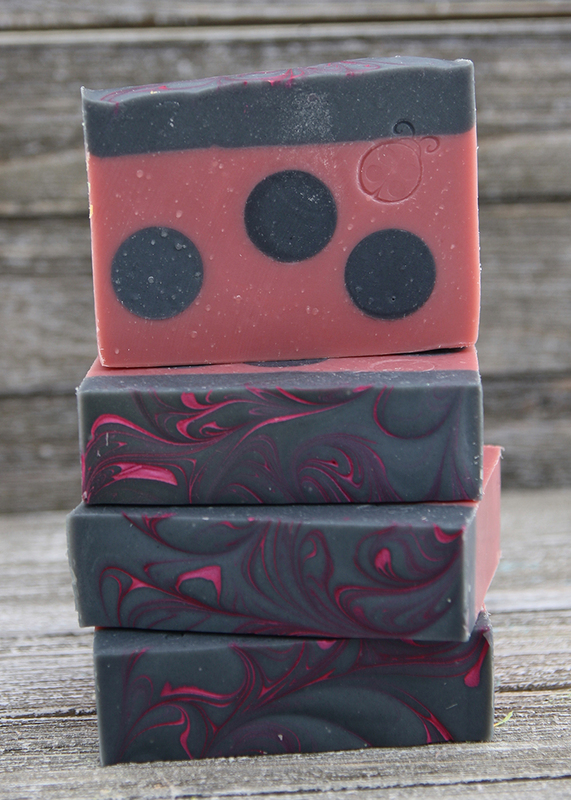 I was pleased how the six color swirl came out. I was afraid it might blend and get murky looking, but the colors stayed separate. 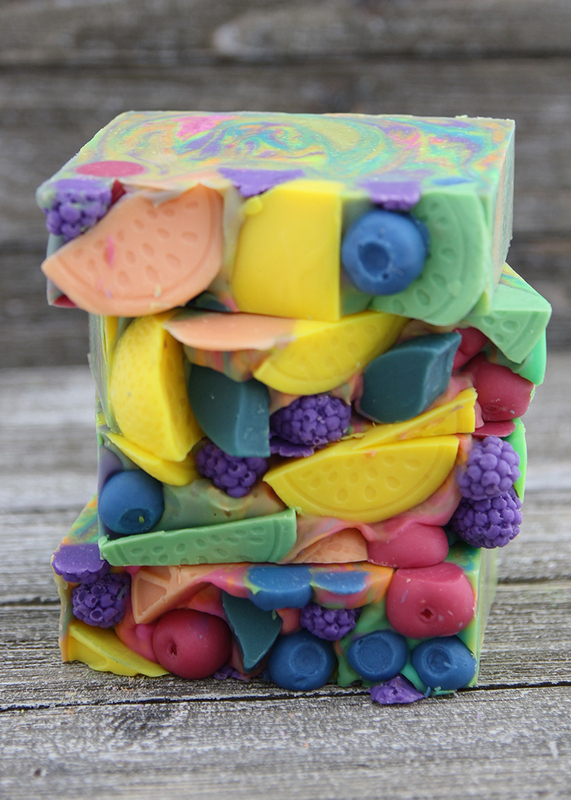 This fragrance oil is a blend of Lemon, Grapefruit, Peach Nectar, Raspberry, Pink Tulip, Soft Jasmine, Magnolia, Wild Honeysuckle, and Sheer Musk. I don’t know what made me want to make these. I’m sure I saw someone post one and it probably caught my fancy and I thought they’d be fun to make. 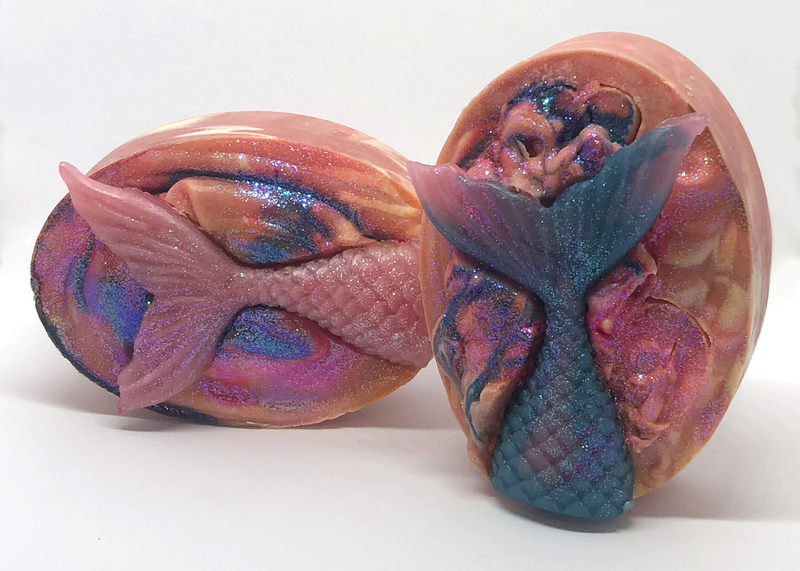 Whatever the reason, I was browsing online looking for a mold and came across the mermaid tail molds…and next thing I know I’m making mermaid tails. I spent a couple days sketching ideas for how I wanted to make the mermaids and ultimately had three designs I wanted to try and a couple that were a variation of the original designs. Some of these turned out great others I really didn’t like. 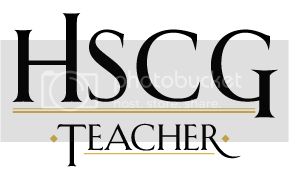 Ultimately there were two designs I’ve decided to go with moving forward. 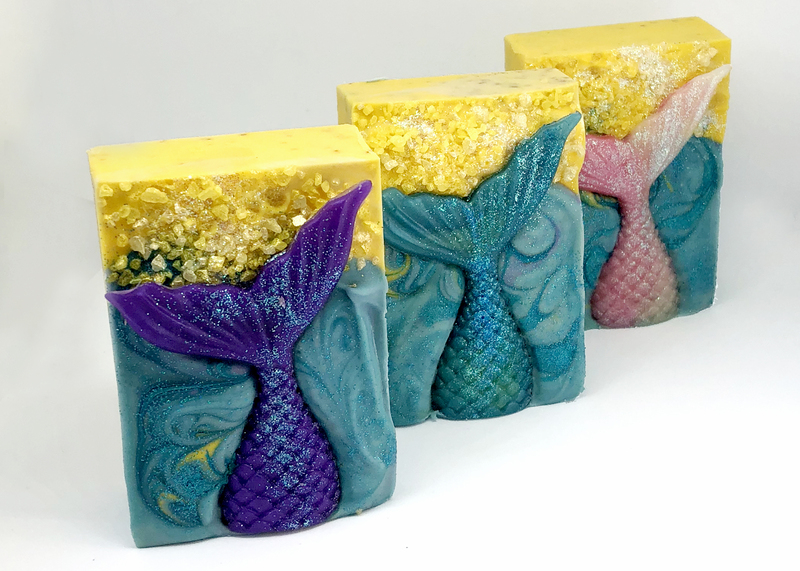 Here’s a peak at the process and the trial and errors of making mermaid soaps. It’s safe to say I got a little obsessed with these fellas. They just make me smile and I can’t help but want to make more and more! I used multiple techniques for these and I really liked them. It’s one of the designs I’m going with. First off, the color morphed and I really hate the color it became. Second, the fragrance accelerated and I couldn’t get the swirl on the top I wanted. Third, I just didn’t like the appearance or shape at all. 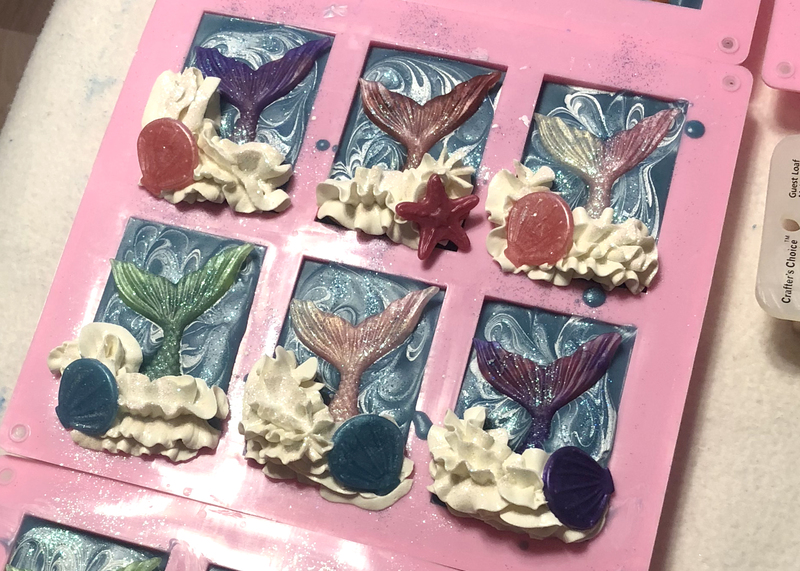 I think if I had a bigger rectangular mold these would have worked better, but there just wasn’t enough space for everything to work. Too much of the tail got covered. I loved the beach look of these. They’re more work to make and definitely a bit of a pain to do the sand (though I love the end result). These and Design 1 are my two favs! 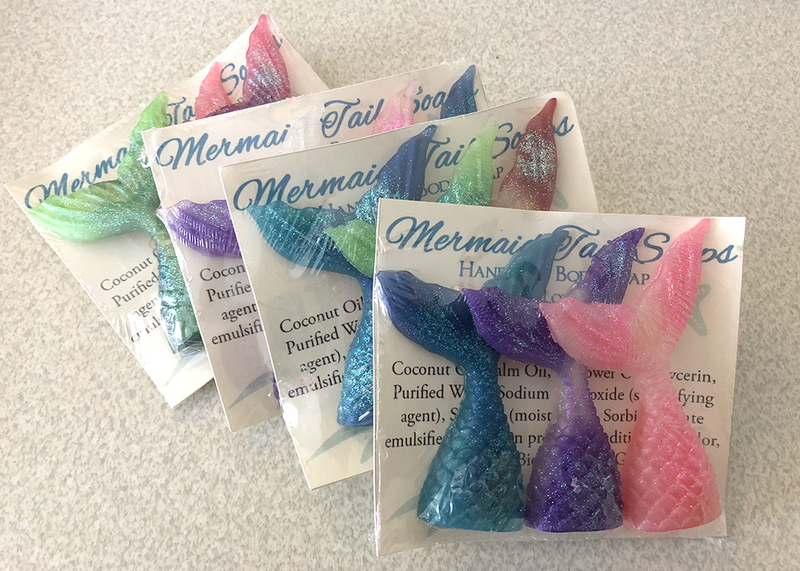 Then I created little three packs of just tails. 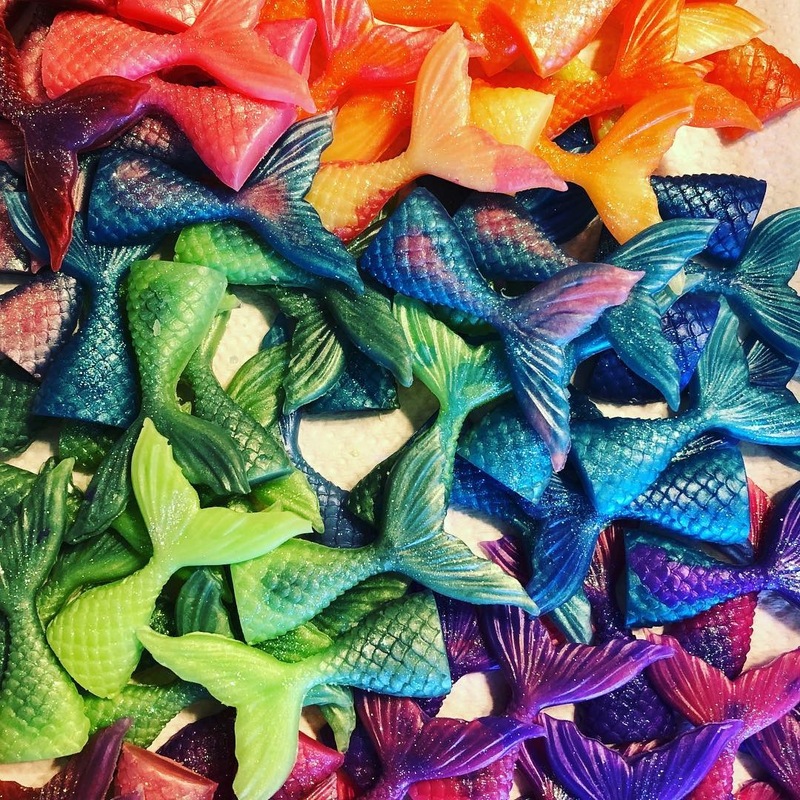 I love the bars, but I also could stare at the tails all day long!And I had fun with the packaging! 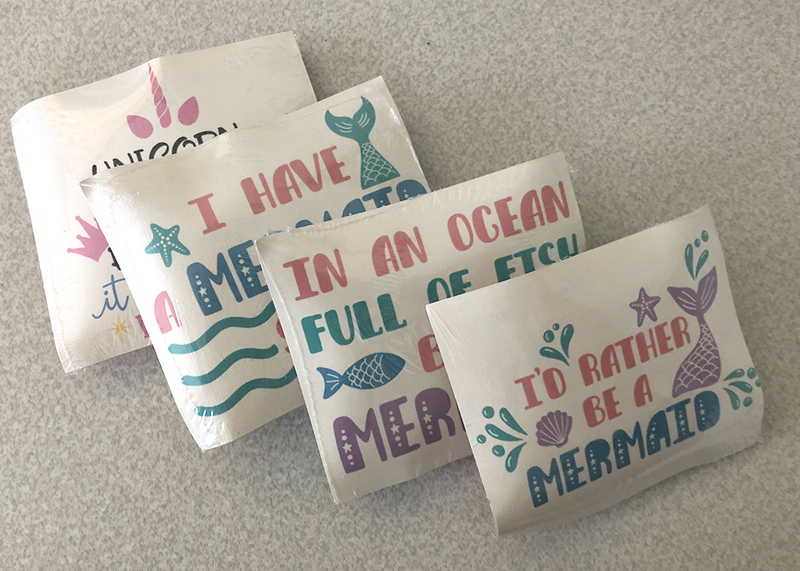 The mermaid “sayings” on the back just make me smile! 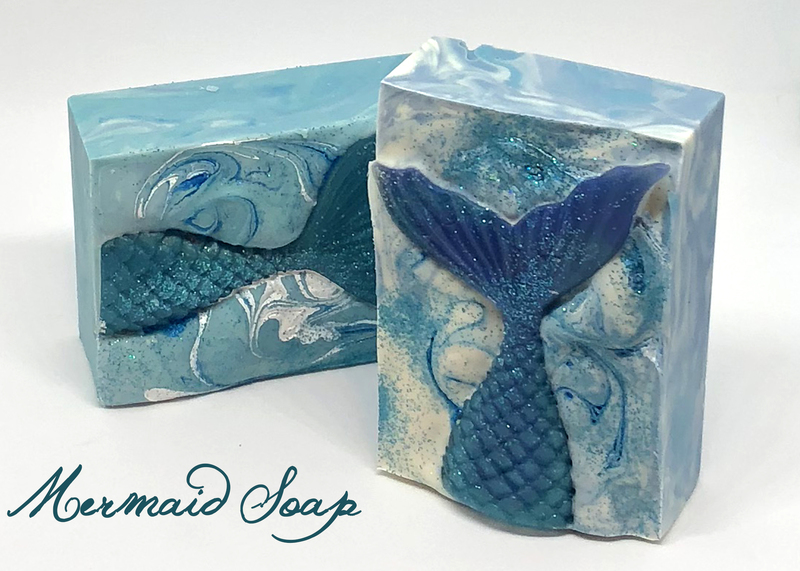 Most people see this soap and love the design. It is NOT what I was going for. The flowers are just a complete disaster. They were not what I was going for, but it’s what I had to settle for as it’s all I could actually manage to save the top. Win some, lose some! 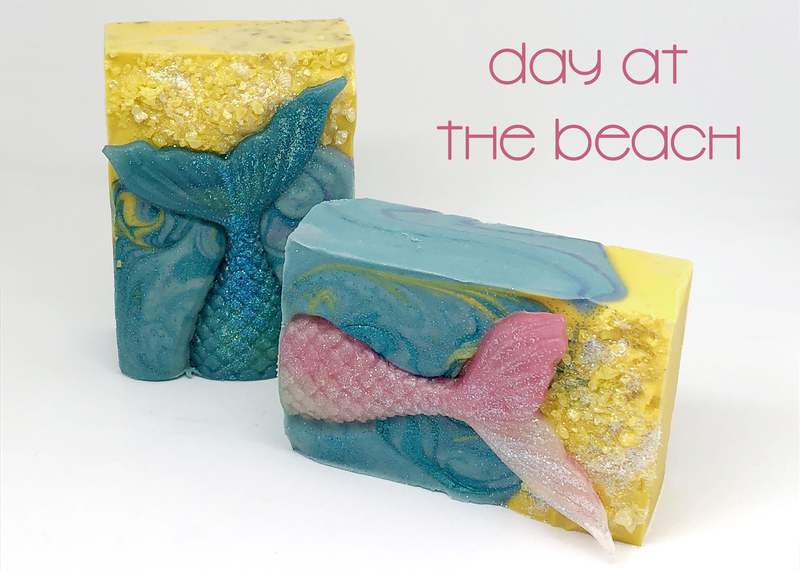 I’d recently seen a number of soaps with colored salt on the top of the bars and I loved (like REALLY loved) the effect. 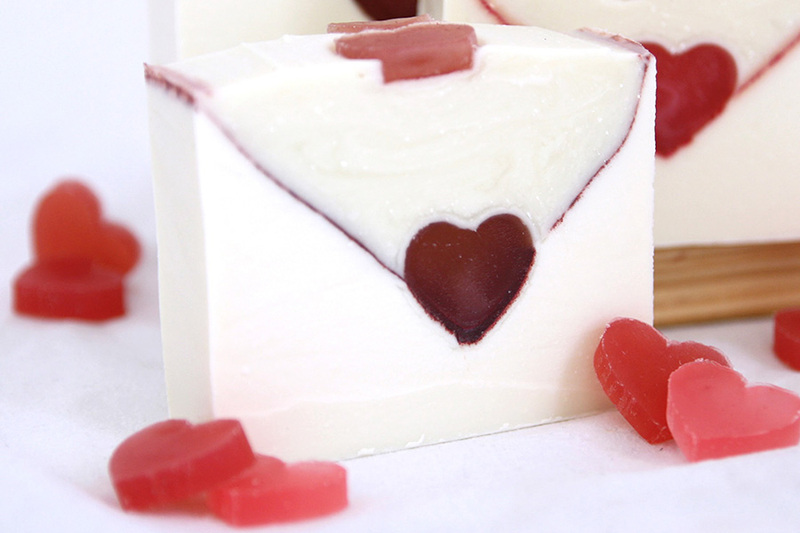 That’s what inspired this soap. I’ll definitely use the salt top more in future designs. It’s a simple effect but so pretty! 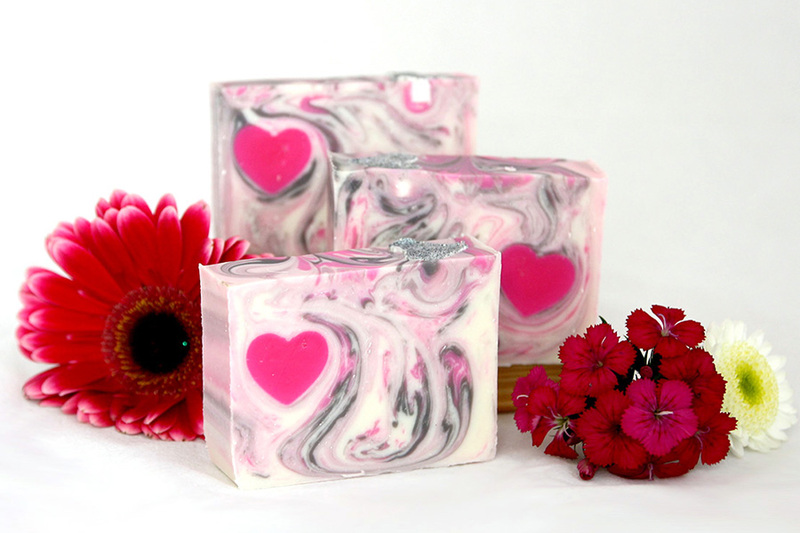 This fragrance is a floral blend of gardenia and jasmine with a strong orange flavor bottom note.